Tomato Tarts and a Call For Shoveling! Today was my last delivery to St. Luke’s for the season. It feels crazy to think that the season is winding down, but here we are. In that frantic race to the end, I forgot a very important e-mail: Meagan’s post about her delicious, beautiful tomato tarts! So if you salvaged your tomatoes before this past weekend’s frost, there is a phenomenal use for them at the end of this post. In other news, WE ARE HAVING A SHOVELING PARTY! Who’s excited? Anyone?! Well, I am. 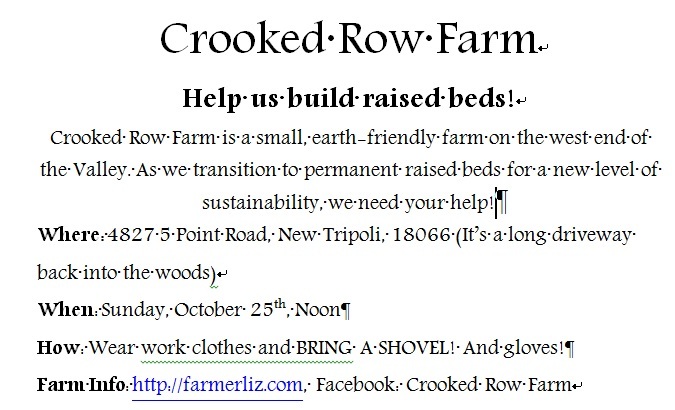 Crooked Row and some delightful supporters from Northampton Community College, plus any of you folks who read this and are feeling motivated, are teaming up this Sunday to dig some permanent raised beds! Help us save some microbiology from tractoring! Help us control weed pressure and grow higher yields in the forthcoming seasons! Come get dirty and eat some farm food with us! See below for details, and share with your team. Remember, BYOS – Bring Your Own Shovel (if you can). And gloves, if you want to protect your hands! Contact me at liz.m.wagner@gmail.com if you have any questions, or want to get involved! I’m thinking pumpkin soup and frittata. Get excited. And now, what you are waiting for – RECIPES! I have a confession: I’m a bit of a mess in the summer time. I get so wholly consumed with almost anything and everything. I make the best, most well-intentioned plans only to have them slip my mind and go unfulfilled. I did notice something recently about myself, though. Something I live for during the summertime, more than anything else: The moment I can turn on my oven without it adding to the deadening heat outside (which is also inside), to fill my home with the aromas of intense, flavorful foods without skirting away from actually having to eat hot food. In short, I live for the moment the seasons begin to change, especially the coming of fall. I love the colder nights during late summer, as well. I think it gives us a chance to relish in the flavors and aromas of summer– for instance, this tomato tart, my final ode to summer with a celebration of quite possibly one of the best parts of late summer and early fall: root vegetables. This is a traditional tomato pie, like the ones I grew up with in Tennessee, not an Italian-inspired tomato pie.I hope you enjoy it–I think its blend of nuts, root vegetables, and the last of summer’s tomatoes will be irresistible in the low 60s of September. 1 tbsp olive oil Choose a low-sodium broth or make your own! You will also need 2 large, amazingly ripe tomatoes. Try to choose varieties with lots of flavors and colors! If making crust, sift the flour and salt into a bowl, make a well and drizzle in the oil and herbs. Mix until it looks sandy or clumpy. Slowly add water and mix until it starts to ball up. This won’t be as delicate as a fruit pie dough, but don’t over-mix it! Once it is balled up, turn out onto a floured surface and knead very gently until it looks cohesive. Cover, refrigerate and let rest about 10 mintutes. Chop potatoes and carrots into even pieces, place into a pot of water and boil until tender. Strain potatoes/carrots, then strain the nuts. Place everything in a blender and blend until creamy. Set aside. Roll out dough to fit tart pan or pie dish. This should be enough for one crust. Cover the surface of the crust with a piece of wax paper and either beans or pie weights, and blind bake for about 10 minutes. If you’re using phyllo dough for this, you can skip ahead. After the crust is ready, fill with the filling and top with large ⅓-½ inch pieces of tomatoes. Sprinkle with olive oil and salt if you wish, but that’s not necessary. You could alternatively crush up fresh nuts and place them between the filling and the tomatoes. Slightly press the tomatoes into the filling, bake until tomatoes are nice and roasted, about 25-35 minutes. Allow to rest at least 30 minutes before eating. If you would like to make a gluten free crust, I suggest mixing coconut flour, crushed walnuts or pecans, buckwheat or rice flour (1:1 with coconut flour), salt, and olive oil to make a cohesive crust similar to a graham cracker crust. I’ve not worked much with gluten free crusts, but I think these ingredients would make a great one! Thank you, for the updates.